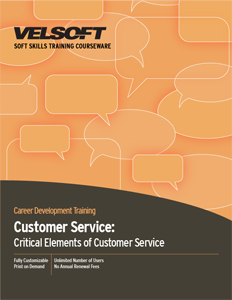 Customer Service Training Materials are designed for developing staff and managers’ knowledge of the critical elements of customer service. Confidently train your employees what customer service is, how to meet expectations, telephone techniques, dealing with difficult customers, how to become a problem solver and more! Seeing is Believing This sample manual to teach Customer Service is in MS Word format. Customers have evolved and are much more knowledgeable and sophisticated than ever. Not only do they expect more from business and products, but they can also readily research the competition. Customer service representatives must be able to think quickly, adapt to different types of customers, and provide excellent service if the company is going to stand out. Velsoft's Customer Service Training Materials will teach all of this and more, and comes with all of the material necessary two full days' worth of workshop training. Students learn the six critical elements of customer service, and how to improve their customer service skills. Material covered includes telephone skills, dealing with difficult customers, the importance of empathy, and how to deliver stellar customer service every time. All of Velsoft's training material is fully customizable for trainers, who are also able to combine their classroom instruction with eLearning, a blended learning solution that makes improving customer service skills and practicing techniques even more flexible and encouraging.